Black Galaxy granite is a mostly black granite with small gold or white flecks.Black galaxy granite is available in a number of finishes including polished and honed and available in both slabs and tiles. 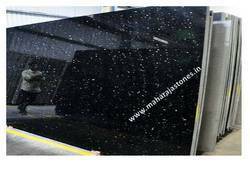 With the valuable assistance of skilled team of professionals, we are engaged in offering an extensive range of high-quality Black Galaxy Granite Slab. Widely used to fit in the residential areas for increasing the interior look. 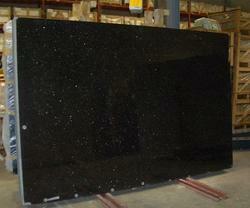 all size available and thikness are 17mm to 30mm , we are providing the high-quality of Black Granite Slab.